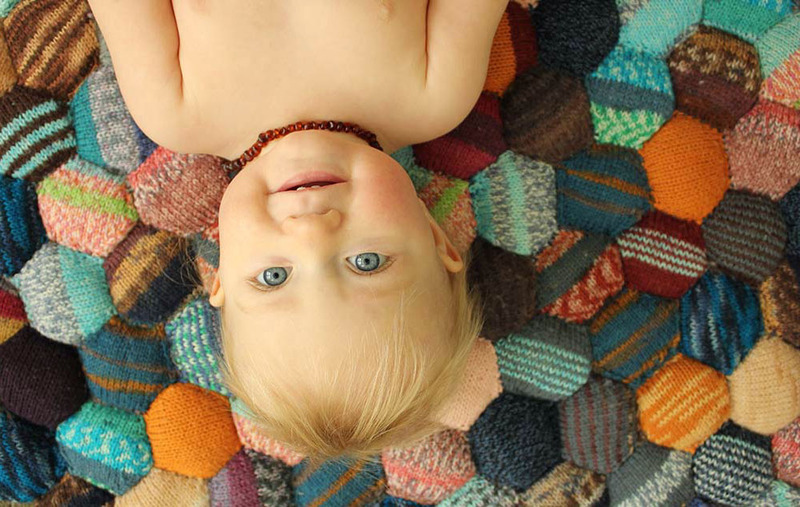 Lucky this pattern, the Beekeeper’s Quilt by Tiny Owls Knits, is as charming as it is crazy. I think that’s why it’s become the darling of the internet knitting world. The final result is squishy, colorful and just useless enough to melt your heart. 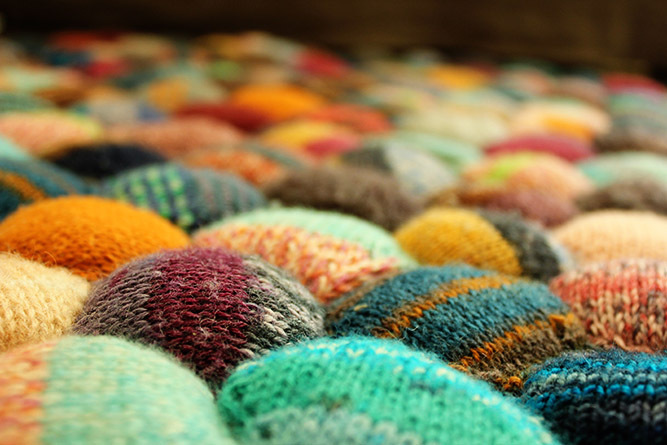 At about 30 minutes per puff, I estimate that the knitting alone on this project took about 80 hours. TWO FULL WORK WEEKS. Lordy. 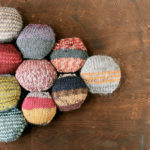 My first thought is that I would love for knitting small squishy yarn pillows to be my 40-hour-a-week job and secondly, holy cow, I cannot believe I actually finished this thing. I’d probably still be sitting with a bag of sock yarn if I hadn’t roped my mom into helping me out using this fancy Mini Skein Care Package. 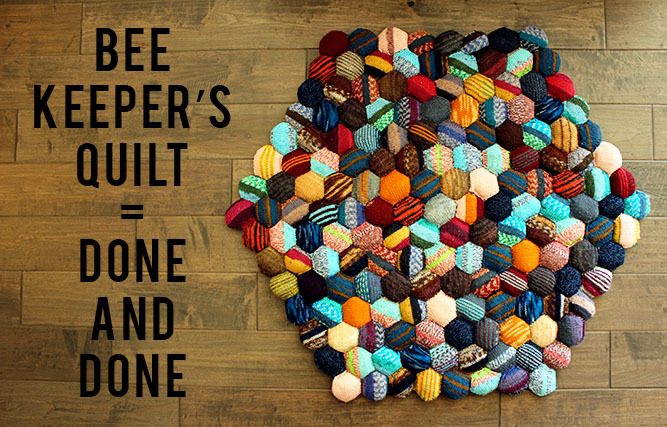 If you’re considering making a Beekeeper’s Quilt of your own, I would wholeheartedly encourage you to go for it. 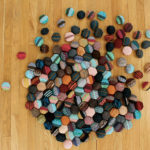 It’s sort of like childbirth–the finished product is so amazing and wonderful it helps you forget all the work that went into getting there. The final rug/pad/squishy amoeba thing has been a wonderful place for The Little to practice tummy time, get a little baby massage and now, roll, tumble and crawl all over. I happened to have one of those fearless kids that should have probably been born with a helmet on–I for one am very thankful she wasn’t though, for the record–and giving her a little Beekeeper’s Quilt mat is about the closest I can come to providing her with the padded cell she needs. 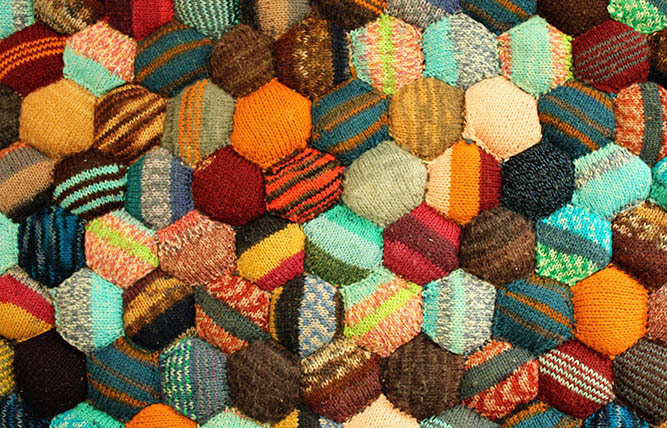 Have you tackled a Beekeeper’s Quilt? How big did you make it? Was it worth all the effort? « Craft With Make and Do Crew at Michael’s! your quilt came our beautifully. this is indeed a sweetheart of a design. i fawn all over pictures of them. will i ever make one i don’t know. 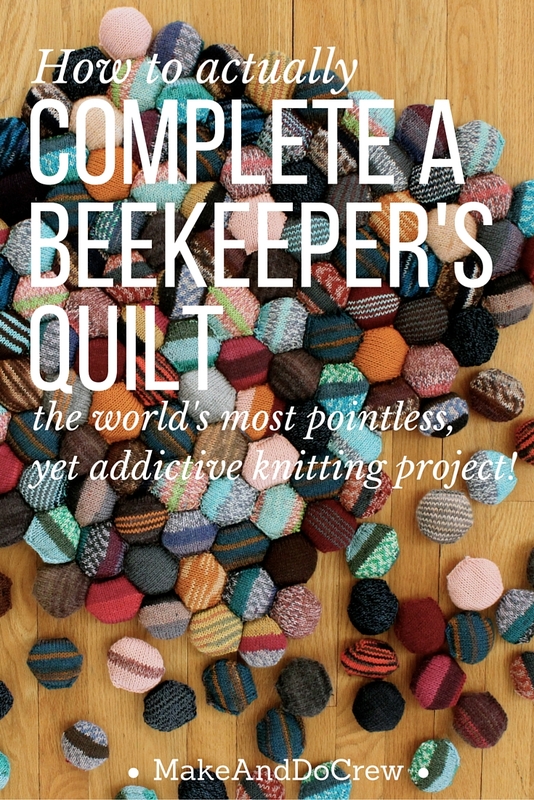 it is definitely the boston marathon of knitting. Wow. This is absolutely breathtaking. Literally, I can scarcely breath it is so lovely. Completely inspiring to the house and child-keeping wife of a beekeeper. Thanks Megan! Real bees? That’s awesome! I’m so happy you like the quilt. It’s a fantastic pattern. I love how it came out, Just found your blog and you do inspire me, I am quite sick and am left unable to craft for too long so I look up other people’s work which leaves me in awe. Well done, and your little sweetheart is one beautiful little bee. Aw, thank you Nathalie. I hope that you’re able to get your hands making again soon. 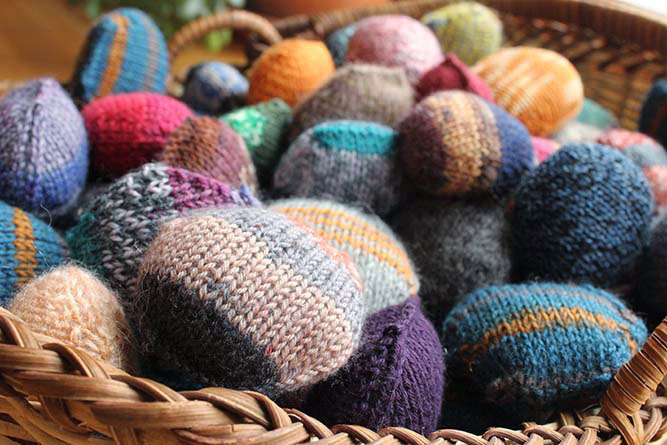 I know how much comfort crafting and crocheting brings me and I wish the same for you. Do you spend much time on Instagram? 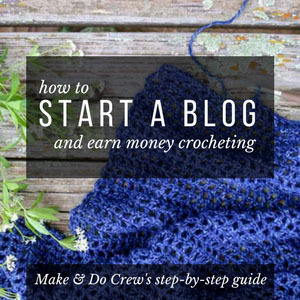 I’m blown away by the amount of DIY/crochet/knit inspiration there. Hi! A group of friends and I have been working for over 2 years! It’s crazy! Yours turned out so beautifully! How many hexis did you end up making all tighter! I meant all together! Sorry I’m mobile, haha. Oh what a fun friend project, Tabbi! I love the idea of doing it together. 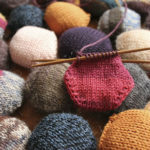 My mom helped me make hexies–otherwise I’m pretty sure I never would have finished! I ended up with 169 total. How many do you guys have done? Just found this and it looks amazing! 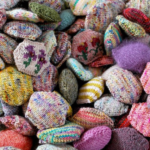 I’m currently doing a hexi puff blanket for number 3 child and have made about 750 so far. Goal is 1200. Very addictive to do! WOOOOOOAH!!! 750!?! Jill, you are amazing! Especially considering that you have two children already. I’m am seriously impressed. I’m sure the end result will be stunning! Yes! It’s a really fun project to work on over time!